Day cream and make-up base, easily absorbed. Has a 5+ sun protection filter. Revitalising. Leaves no residue. Marine Day Cream is a SPF 5 protective cream suitable for mature skins. It is very rich in trace elements that stimulate biological reactions, boosting the skin energy. Marine Day Cream is an excellent make-up base that is suitable for sensitive skin. 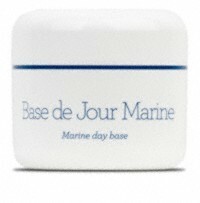 Use Marine Day Cream in the morning, by itself or after your specific cream. Apply a very small amount to the whole face and eye and neck areas. Follow with your make-up if desired. Companion products are Marine Ger-Lift and Marine Mask.